Public oratory has seldom been as pivotal in generating and sustaining the vitality of a movement as it was during the rise and rule of the charismatic Adolf Hitler. 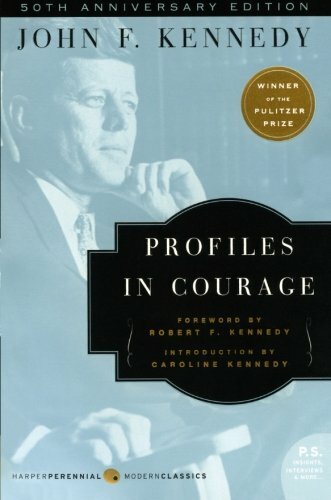 JFK's inspiring true accounts of 8 unsung heroic acts by American patriots at different junctures in our nation's history, hiss book became required reading, an instant classic, and was awarded the Pulitzer Prize. Germany: German authorities arrest large numbers of Jehovah's Witnesses, sending some of them to concentration camps. Spain: Day 43 of 985 of the Spanish Civil War. Nationalist warplanes bomb Madrid for the first time. Spain: Day 408 of 985 of the Spanish Civil War. CBI - China: Day 53 of 2,987 of the 2nd Sino-Japanese War. Day 16 of 106 of the 2nd Battle of Shanghai. Spain: Day 773 of 985 of the Spanish Civil War. Germany: Sudeten Germans begin talks with the Czech President Eduard Benes, but the Czech government refuses any partition. CBI - China: Day 418 of 2,987 of the 2nd Sino-Japanese War. Day 79 of 139 of the Battle of Wuhan. Chinese troops recapture Taihu County. In Hubei Province, the Japanese capture Liuan. 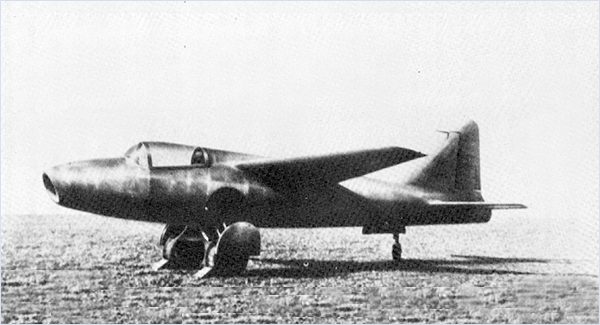 Germany: The Heinkel He 178, the world's first jet aircraft, flies for the first time. Two people are credited with inventing the jet engine. Sir Frank Whittle of Great Britain and Hans von Ohain of Germany both conceived of and built the first jet engines during the 1930s independently of each other. Whittle first originated the idea of the jet engine as a 22 year old officer in the Royal Air Force. He was awarded a patent for his innovation in 1932 and published his findings widely, but his ideas received little attention. Undeterred, Whittle went to work for a research company called Power Jets in 1936 and proceeded to develop a working model of his engine for possible military applications. After tackling and solving many technical problems, Whittle finally began receiving support from the British government in 1939. Meanwhile, German engineer Hans von Ohain had begun his own independent studies of jet propulsion in the early 1930s while working on his doctorate at Göttingen University. von Ohain had completed a working model of his engine by 1935 and approached Ernst Heinkel about building an aircraft to test such a device. Detailed work to design and build both a more powerful engine and a suitable airframe began in 1937, and von Ohain's engine was the first jet to fly when the Heinkel He 178 took to the air on 28 August 1939. Back in Britain, the Air Ministry had become sufficiently impressed with Whittle's ground tests that an order was placed for a flight-worthy engine to be installed in an aircraft built by Gloster. The aircraft was completed in March 1941 and the engine the following May. Whittle's engine was first flown in the Gloster E.28/39 on 15 May 1941. Although it took several more years for both nations to recognize the value of the jet engine, both the Royal Air Force and German Luftwaffe put out requests for jet-powered fighters. The resulting Messerschmitt Me 262 and Gloster Meteor both saw action in the closing months of World War II. CBI - China: Day 783 of 2,987 of the 2nd Sino-Japanese War. CBI - Mongolia: Day 110 of 129 of the Battle of Khalkhin Gol, a border dispute between the Soviet Union and Japan. USA: The US Army transport AMERICAN LEGION arrives to New York City with Norwegian Crown Princess Martha. Atlantic: German sub U-101 damages the Finnish ship ELLE 200 miles northwest of Ireland which will later be scuttled by a rescue ship. U-28 sinks the British ship KYNO 200 miles northwest of Ireland. ETO - UK: Day 50 of 114 of the Battle of Britain. The Luftwaffe bombs airfields during the day and Birmingham, Coventry, Derby, Sheffield, Manchester, South Yorkshire and Liverpool at night. ETO - France: Vichy French radio stations announce that laws protecting Jews in France have been removed. ETO - Germany: The RAF bombs Berlin during the night. Germany: Adolf Hitler orders his troops to prepare for an occupation of Romania should war break out in that country. East Africa: Day 80 of 537 of Italy's East African campaign in the lands south of Egypt. PTO - Japan: After the "voluntary dissolution of all political parties," President Konoye of Japan announces a new structure to "unite the total energies of the state and people." CBI - China: Day 1,149 of 2,987 of the 2nd Sino-Japanese War. Day 288 of 381 of the Battle of South Guangxi. Day 9 of 42 of the Hundred Regiments Offensive. USA: The film "No Greater Sin" is released. It warns young soldiers about the dangers of dating prostitutes and the spread of syphilis. It does not get Hays Office approval and is condemned by the influential Legion of Decency, which says that it presents subject matter that is unfit for the screen. The film warns young soldiers about the dangers of dating prostitutes and the spread of syphilis. It does not get Hays Office approval and is condemned by the influential Legion of Decency, which says that it presents subject matter that is unfit for the screen. The US military knew of the crippling effect that sexually transmitted diseases could have on their fighting forces from previous wars, and went to great lengths to educate soldiers with training films and posters. But "boys will be boys" which made the task a difficult one. Add to it the fact that most soldiers were nearing their sexual peak, away from the moral constraints of home and, as they entered into combat, unsure they would survive the next day. Tough as it was to educate soldiers in the service, a film like "No Greater Sin" faced a much more difficult challenge approaching a subject that mainstream society was content to ignore. Explicit dialog and action would not pass social scrutiny, let alone get the approval of the Hays Office. Films of the era often resorted to cloaked references to sexual encounters with symbolism, such as showing a sultry woman offering an apple to a clean cut young man; the apple representing "forbidden fruit" and a close up showing a worm protruding from the apple insinuating the danger that awaited the man without the moral backbone to resist. Atlantic: German subs U-101 and U-558 attack an Allied convoy 330 miles west of Ireland during which U-558 sinks the British merchant ship OTAIO. ETO - Netherlands: The RAF bombs targets at Rotterdam. ETO - Germany: British Lt Airey Neave attempts an escape the POW camp at Colditz Castle with a fake German guard uniform, but he is spotted near the front gate and captured. Russian Front - Ukraine: Hitler and Mussolini meet near the Russian Front to visit and inspect troops of Army Group South, which include several Italian divisions. This is the tenth of their fourteen meetings. Russian Front - Finland: Day 61 of 142 of Operation SILVER FOX, a joint German-Finnish campaign to capture the Russian port of Murmansk in the Arctic. Russian Front - Finland: Day 59 of 140 of Operation ARCTIC FOX, a joint German-Finnish campaign against Soviet Northern Front defenses at Salla, Finland. Russian Front - Finland: Day 68 of 164 of the Battle of Hanko. Russian Front: Day 68 of 167 of Germany's Operation BARBAROSSA, the invasion of the USSR. Russian Front - Center: Day 12 of 23 of the Battle of Dukhovshina, Russia. Russian Front - Center: Day 36 of 38 of the Battle of Gomel, Belarus. Russian Front - South: Day 6 of 35 of the 1st Battle of Kiev, Ukraine. The Soviets blow up the Zaporozhye hydroelectric dam on the River Dnieper to prevent German use. Thousands of citizens are killed by the flooding. Russian Front - South: Day 21 of 70 of the Siege of Odessa, Ukraine. Axis troops begin a new offensive against Odessa. MTO - Libya: Day 141 of 256 of the Siege of Tobruk. After demands from Australia's new Prime Minister, the British agree to relieve the remainder of the 9th Australian Division from Tobruk. Middle East: Day 4 of 24 of the Anglo-Soviet invasion of Iran. Iran's Prime Minister Mohammad Ali Furughi signs a treaty allowing the UK and the USSR to occupy their oilfields and the Trans-Iranian Railway, as well as closing down German, Italian, Hungarian and Romanian legations in Tehran. However, he refuses to allow Allied troops to enter and occupy the capital city. East Africa: Day 445 of 537 of Italy's East African campaign in the lands south of Egypt. CBI - China: Day 1,514 of 2,987 of the 2nd Sino-Japanese War. PTO - Australia: Robert Menzies resigns as Prime Minister and is replaced by Arthur Fadden. USA: Clark Gable completes US Army Air Force training and is commissioned a 2nd Lieutenant. The Commanding General of the US Army Air Forces gives Gable a "special assignment" in aerial gunnery: to make a recruiting film in combat to recruit aerial gunners. USA: A Japanese seaplane, catapulted from submarine I-25, drops firebombs on a forest in Oregon. Its mission is to see how easily they might be able to cause widespread destruction and panic, but the six trees they ignite are quickly and easily extinguished. Atlantic: German sub U-94 attacks an Allied convoy off Haiti but is counter-attacked by the Canadian Navy and rammed twice after being forced to the surface. The submarine is scuttled by her 45-man crew of which 19 go down with the boat. ETO - France: US 8th Air Force B-17s bomb an aircraft factory at Meaulte. ETO - Germany: The RAF bombs at Nürnberg, killing over 4,000 civilians and destroying over 10,000 houses. Russian Front - North: Day 355 of 872 of the Siege of Leningrad. Russian Front - North: Day 116 of 658 of the Siege of the Kholm Pocket. Russian Front - Center: Day 30 of 64 of the 1st Battle of Rzhev-Sychevka, Russia. Russian Front - Center: The Soviet continue an offensive on the Moscow front. Russian Front - South: Day 6 of 165 of the Battle of Stalingrad, the bloodiest battle in human history. German troops break through southwest of Stalingrad but those attacking on the north side are held. Russian Front - South: Day 62 of 150 of Germany's CASE BLUE. MTO - Libya: US B-24s bomb docks, shipping and jetties in the harbor at Tobruk. East Africa: Day 116 of 186 of the Battle of Madagascar. CBI - China: Day 1,879 of 2,987 of the 2nd Sino-Japanese War. 106 of 124 of Japan's Zhejiang-Jiangxi Campaign, launched to punish anyone suspected of aiding the Doolittle raiders in China. Roughly 250,000 Chinese will be killed. CBI - Indochina: US B-25s attack targets in French Indochina. PTO - Alaska: Day 83 of 435 of the Battle of Kiska, Aleutian Islands. US 11th Air Force bombs targets on Kiska Island. PTO - Malaya: Day 191 of 357 of the Battle of Timor Island. PTO - New Guinea: Day 39 of 119 of the Battle of the Kokoda Track. US 5th and 13th Air Forces provide air support. PTO - New Guinea: Day 4 of 14 of the Battle of Milne Bay. PTO - Solomon Islands: Day 22 of 187 of the Battle of Guadalcanal. US 5th Army Air Force provides air support. The Japanese try to land more reinforcements but are turned by US Marine fighters, sinking the Japanese destroyer ASAGIRI. ETO - Denmark: The Danish government refuses a German ultimatum, as their sabotage campaign reaches a crescendo. Russian Front - North: Day 720 of 872 of the Siege of Leningrad. Russian Front - North: Day 481 of 658 of the Siege of the Kholm Pocket. Russian Front - Center: Day 12 of 48 of the Battle of Bryansk, Russia. Russian Front - Center: Day 22 of 57 of the 2nd Battle of Smolensk, Russia. Russian Front - South: Day 5 of 122 of the Battle of the Lower Dnieper River in Russia. Russian Front - South: Day 47 of 48 of the USSR's Lvov-Sandomierz Offensive. Bulgaria: King Boris III of Bulgaria dies under mysterious circumstances. MTO - Italy: The imprisoned Mussolini is moved from the island of Maddalena off Sardinia to Lake Bracciano by seaplane, then by car to the Hotel Campo Imperatore, aka Albergo Refugio at Gran Sasso. MTO - Italy: The Allied Air Forces attack targets in Sardinia and Italy. CBI - China: Day 2,244 of 2,987 of the 2nd Sino-Japanese War. PTO - Japan: The USS POLLACK sinks the passenger-cargo ship TAIFUKU MARU off Kyushu. PTO - New Guinea: Day 129 of 148 of the 2nd Battle of Lae-Salamaua. US 5th and 13th Air Forces provide air support. PTO - Solomon Islands: US troops cross the Hathorn Sound from New Georgia to Arundel Island and capture Japanese artillery positions which had been shelling US positions at Munda Point on New Georgia. PTO - Solomon Islands: Day 14 of 56 of the Battle of Vella Lavella. US 5th and 13th Air Forces provide air support. ETO - UK: Day 77 of 86 of the V-1 "Buzz Bomb" offensive on Britain. ETO - France: US troops cross the Marne River. ETO - France: Day 28 of 284 of the Battle of Brittany. ETO - France: Day 14 of 32 of Operation DRAGOON, the Allied invasion of southern France. Allied troops continue racing up the Rhone Valley. ETO: US 8th Air Force fighters attack targets on the German-French border and railroads in Belgium, the Netherlands and France. Russian Front - North: Day 19 of 28 of the Battle of Tartu in southeastern Estonia. Russian Front - Center: Day 32 of 32 of the Battle of Kaunas, Lithuania. The Soviets have driven German Army Group Centre out of Lithuania. Russian Front - South: Day 9 of 10 of the Battle of Romania, 2nd Jassy Offensive. MTO: US 15th Air Force bombs targets in Austria, Hungary and Italy. CBI - Burma: Day 150 of 302 of the Chinese Salween Offensive. US 10th and 14th Air Forces provide air support. The British 36th Division captures Pinbaw during a monsoon. CBI - China: Day 2,610 of 2,987 of the 2nd Sino-Japanese War. Day 134 of 259 of Japan's Operation ICHI-GO. PTO - Caroline Islands: US 7th Air Force bombs on Yap and Ponape Islands and in the Truk Atoll. PTO - Dutch New Guinea: Day 58 of 61 of the Battle of Noemfoor. Although the island has been declared secured, bitter fighting from Japanese continues. PTO - New Guinea: Day 258 of 597 of the Battle of New Britain. US 13th Air Force provides air support. PTO - New Guinea: Day 129 of 481 of the Battle of Western New Guinea. 5th Air Force provides air support. PTO - New Guinea: Day 76 of 80 of the Battle of Lone Tree Hill. 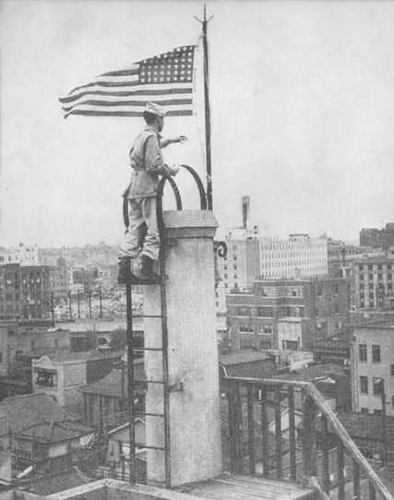 Japan: The first American flag to fly over Tokyo is hoisted above the Nippon Times building, two days before the "official" flag will be raised over the US Embassy compound in the presence of Gen MacArthur. There's certainly a bit of confusion as to when this photo was taken. Some online sources say it was taken on September 5th or even the 6th, while others say it was taken two days before the "official" flag was raised at the United States Embassy compound in the presence of General MacArthur, which we have determined would place it on August 28, 1945. One online source identifies the man hoisting the flag as Lt Bud Stapleton of Syracuse, NY, though we have been unable to confirm that. Europe: Indictments are made against accused Nazi war criminals. Burma: Japanese troops in Burma sign the surrender agreement in Rangoon. China: US B-29 bombers continue dropping food and supplies for the Churon Temporary Prisoners of War Camp in northern Formosa (Taiwan). Three of the POWs are accidentally killed by falling 50-gallon drums. Japan: In Japan, an advance guard of 150 US airborne troops lands at Atsuki airfield outside Tokyo. They are the first Allied troops to set foot on the Japanese mainland. Malaya: The battleship HMS NELSON anchors off Penang to accept the Japanese surrender in Malaya. CBI - China: Day 2,975 of 2,987 of the 2nd Sino-Japanese War. Day 20 of 25 of the Soviet Invasion of Manchuria. Soviet troops land at Rubetzu Bay on Iturup, Kurile Islands, Japan, as well as on seven other nearby islands. How do you convince men to charge across heavily mined beaches into deadly machine-gun fire? If you're the US Army in 1944, you dangle the lure of beautiful French women, waiting just on the other side of the wire, ready to reward their liberators in oh so many ways. World War II did not end on the battlefield, but in a courtroom in Germany, where the full scope of Nazi Germany's atrocities brought justice to top Nazi leaders.